Ok, so these are the easiest treat in the world! I saw them on Pinterest last month and decided to try them out with L. On a side note, Pinterest is a disaster zone if you like sugar a little too much, strive for perfection in the home, or are prone to envy. Use it with caution, realizing that not one of us has it all together! 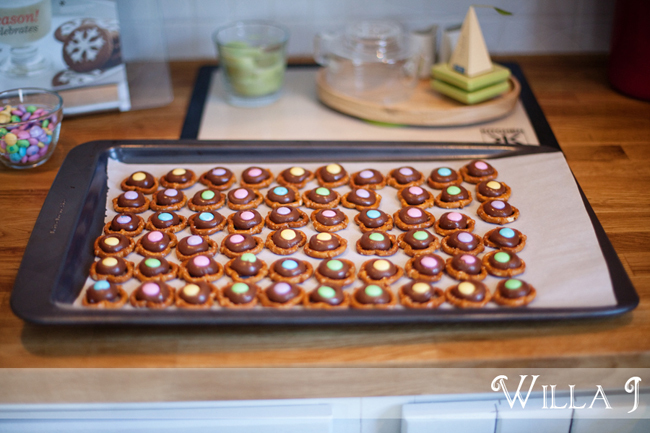 Anyhow, we used Easter candy with these pretzel bites for a Spring look. And the best part? L could participate in every step and loved it. They're great if you're looking for an easy treat for kids or even something simple to add to your wedding dessert table. Hope you're enjoying the sunshine!